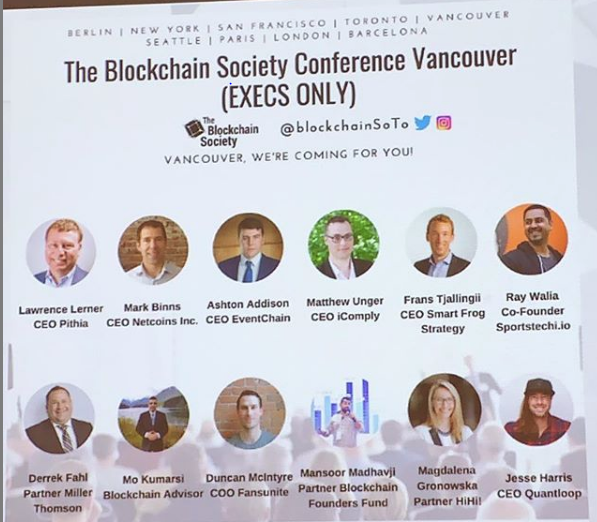 The Blockchain Society is hosting a special conference for investors, regulators, corporate and blockchain thought leaders on January 15, 2019 at Fasken Martineau DuMoulin LLP. STOs were the talk of the town in North America for over a year now and is starting to be more prominent in Asian countries where ICOs were still running hot into October of 2018. iComply Matthew Unger spoke about the importance of staying on the safer side of regulation to avoid future headaches and also how he has noticed an industry mindset shift from ICO big money raises to more conservative STO – equity style investments where smaller raises for proof of concept is becoming more standard. All this is good for the credibility of blockchain as a whole. Stable coins continue to be of significance in the reality of cryptocurrency volatility. Biggest use right now during offerings is to convert directly to stablecoin to protect funds similar to the QUDE token design by Quantaloop Technologies Inc.
Great audience question by Ashton Addison of Event Chain (BLOCKCHAIN SECURED EVENT TICKETING) asking about the profit/monetization potential of a stable coin. The answer of panel being that the stable coin is designed to be a component of an ecosystem as opposed to the main event. Another investor answered that the stable coin is a way to collect a huge pool of funds to which fund managers would use in other safe growth vehicles for returns. Emerging technologies are in CarbonTech, Eco Initiatives, Social Impact, real world utility beyond fintech, AI, IoT highlighted the stage. Impact investing continues to grow and mature. Investors looking to put their money in funds that screen for environmental, social and governance issues, or ESG, now control a whopping 25 percent of U.S. investments. Frans Tjallingii, co-founder and CEO of First Coin Capital spoke passionately about the digital identity of the homeless under New Leaf Project. Ray Walia, founder of Launch Academy and cofounder of Victory Square added a light touch, talked about how emerging technologies and data can be used in sports entertainment, joking how he was sitting between a guy that wants to help the homeless and another guy that wanted to save the planet. Real world use cases for blockchain as a whole continues to grow and emerge and we will continue to see real industries professionals coming forth to use this technology. 2018 was all about platform building. The numbers of cryptocurrency is not a direct reflection of what is happening in blockchain. It is important to note that blockchain as a technology and crytopcurrency are not synonymous of each other. Mark Binns is the CEO of Netcoins, and has over 20 years of experience building customer-driven sales and marketing strategies. Mark has founded, built, and sold two consulting companies that provided strategic advice on customer acquisition and revenue growth to Fortune 1000 technology companies including RIM, Cisco and Rogers. Mark has also scaled two SAAS based software businesses in the B2C and B2B spaces into leaders in their respective markets. Mark is a Dean’s Honors graduate of the Ivey MBA program and Graduate of the Computer Science Honors program at Acadia University. Mark has led his companies to PROFIT HOT 50 and PROFIT HOT 100 awards, and was nominated by the Dean of the Richard Ivey School of Business for the prestigious business award of Canada’s “Top 40 Under 40”. Lawrence Lerner is the CEO of Pithia, and a pioneer in Digital Payments with a history of success in innovation, both within large corporate and startup structures. During his career, Lawrence has worked across industries in multiple roles (executive, lead technologist, public board director) to enable digital transformation, scaling up businesses using edge technologies and processes creating $100Ms in new revenue. Whether it was re-architecting Dun&Bradstreet’s core product (35% growth), delivering the next generation of coupons across 31,000 retailers, growing an outsourcing business by $100M, defining Motorola’s smartphone/ecommerce strategy or helping launch a dozen startups he’s generated wealth for businesses, owners and shareholders. Lawrence has worked in the cryptocurrency space since the late 90’s. Today he is the CEO of Pithia, a blockchain venture company with four startups in the portfolio. They are currently raising their second blockchain fund. Duncan McIntyre, COO of Fansunite, Duncan is a practicing blockchain and digital asset lawyer and investor. He has experience in mergers, acquisitions, other corporate transactions, and civil litigation. As the co-founder of FansUnite, he has extensive experience in product development, overseeing daily operations and business development. Derrek Fahl is a member of Miller Thomson’s Blockchain, Cryptocurrency and Smart Contracts Team, and has extensive knowledge of the world of blockchain, cryptocurrencies, coins, tokens, smart contracts and raising capital using these emerging technologies, both through conventional securities offerings and Initial Coin Offerings (ICO’s). Derrek has worked for companies in regards to their offering of security tokens (private placements and ICOs), utility tokens (often under the SAFT protocol), stablecoins, token exchanges and other means of secondary market trades. Derrek‘s work for his clients includes planning or reviewing corporate and offering structures, drafting and reviewing whitepapers, offering documents and subscriptions, interactions with securities regulators and other capital market participants, and communications with external advisors, including tax and finance. As a partner of Blockchain Founders Fund, Mansoor Madhavji currently focuses on sourcing top projects from the North America region. He has supported numerous projects on developing sophisticated token economic models, go-to-market and branding strategies. Mansoor previously led growth and marketing strategy as Head of Content with an innovative technology company launching secure digital currency exchanges across South East Asia and India. He is also early stage investor in cryptocurrency, blockchain technology and Initial Coin Offerings. Prior to Crypto Mansoor traded equities and derivatives and ran an international digital marketing and branding agency. Ashton Addison, CEO of Eventchain, has been involved in the blockchain industry since 2013, through the initial rise of Bitcoin price and the lead up to the Ethereum ICO. As the CEO and Founder of EventChain, he pioneered the team through a successful tokensale in September of 2017. He also advises various other Blockchain companies globally including Syscoin and CoinPayments.net in Canada, Pundi X in Indonesia and SmartMesh in China. Together with EventChain and his associated blockchain projects he has helped raise over $50M cumulatively. Matthew Unger is the CEO and co-founder of iComply Investor Services. At 22, he became one of the youngest executive financial advisors in Investors Group Financial Services’ history, building a $42-Million business in under 5 years. He has a decade of technology management consulting experience, driving innovation for companies ranging from high-growth startups seeking to scale into enterprise markets to major multinationals, including Virgin Group, Investors Group Financial Services, BDC, and Bank of Canada. Matthew has also provided consulting services to organizations, such as the Canadian Centre for Cold Climate Innovation and First Nations Technology Council, and has held Secret-Level clearance with CSIS (a.k.a. Canada’s CIA). His previous FinTech experience includes leading the systems architecture in 2015 on an end-to-end digital workflow solution for a wealth management firm in Canada. In 2016, Matthew led the technical management for CME Group’s first proof of concept to use Ethereum to automate the matching and fulfillment of interest rate swaps over LIBOR. Matthew completed MIT Media Lab’s Fintech Innovation Management program with distinction and also holds a management certificate from MIT Sloan in Artificial Intelligence and Business Strategy. Magdalena has 10 years of experience accelerating Ontario to an innovation-based economy, providing strategic advice at the highest levels of provincial government. She has led complex $million and $billion public sector projects to accelerate business growth, innovation, and disruptive tech deployment. Magdalena has dedicated her career to designing solutions that leverage innovative technologies and private markets to maximize sustainability. She advocates for blockchain-based climate change and energy applications and is working with start-ups in the fintech and crypto space. Frans Tjallingii is an experienced leader, entrepreneur, advisor and board member. Most recently he was the Co-founder and CEO of First Coin Capital which was acquired by Galaxy Digital, a full service merchant bank for the cryptocurrency and blockchain industries. At First Coin he worked on different emerging technologies in the FinTech and a variety of other industries. Prior to starting First Coin, he gained an extensive corporate strategy, turnaround and investment analysis experience. He has been a serial start-up enabler since 2014 and is passionate about making an impact in the world, through the startups that he assists and not for profits, such as New Leaf Project which aims to find innovative solutions to homelessness. Frans holds an MSc. in Marine Biology from the University of Groningen and an MBA from the Rotterdam School of Management. Ray Walia is a serial entrepreneur with over 20 years of experience in both the entertainment and technology sectors. Ray founded Launch Academy, Vancouver’s leading entrepreneurship facility, which has hosted more than 600 startups that have raised over $150 Million in funding. In 2015 Ray co-founded Victory Square and in 2017 Launch.vc, two venture build studios with a focus on sports and entertainment technology companies. Ray was named Entrepreneur Mentor of the Year for 2014 and 2015, BIV Top Forty Under 40, G20 Young Entrepreneur, and BC Tech Person of The Year Finalist 2018.